Help! I’ve got me self a glass full of violets! I do! I do! I think every wine writer/aficionado goes through moments where all of their notes seem to run together. Similar descriptors and textures make it appear that we’re tasting the same exact wine over and over again. Sometimes this is laziness and sometimes it’s the result of tasting too many wines in one peer group. When we speak of Portugal, we are often speaking of one particular grape that is the main culprit for my nose filling with lush, vibrant, purple violets: Touriga Nacional. Granted, there are 200+ native grapes grown and used here in Portugal and in combinations that would make your head spin. We’ve smelled and tasted some of the oddest things throughout the past few weeks, but if there was to be one “taste of Portugal” you could argue that Touriga Nacional was to provide it. Here is the intriguing part. We all have our descriptors that we use often, mostly because we are both familiar with those aromas and because they are the aromas that interest us. However, we’ve all come across a tasting note that you just can’t seem to dig up a sensory memory for. For my wife, that is chokecherry. Having grown up with a chokecherry tree in my backyard, I am intimately aware of a chokecherry’s aroma and flavor, but she doesn’t seem have the faintest idea. For many, the aroma of a violet may be completely foreign to those of you in areas like the southwest, were violets are not prone to grow naturally. Yet, if you head into any flower shop, and dip your nose into a dark velvety bunch of purple violets, you will know exactly what I mean. Touriga Nacional is the heart and soul of Portugal as is Tempranillo to Spain, uniquely able to express that same rich floral note, making you think your nibbling on the petal of a violet. However, don’t get any ideas from Wine Library TV, because know that flower shops are not keen on having their customers eat off their plants, regardless of your perfectly reasonable excuse that you’re just trying to expand your sensory memory. Tourgia Nacional is traditionally the backbone and lifeblood to Port wines. 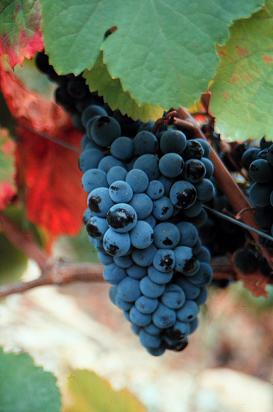 Though Port wine can be made up of 20 or more grapes, Touriga Nacional could be argued to be the defining factor in its makeup. Full of bright acidity and strong tannins, not only does it lend its flavor profile to the wines of Porto, but it also helps with the famous longevity of these noble liquids. But wait, we’re here to talk about table wines, not Port! Your right! And that’s why I’m so excited! Today, and for what is probably the whole history of wine in Iberia, Touriga Nacional has also been found in table wines throughout Portugal. Traditionally, the Dao and Douro were the only regions to use this grape, but times have changed; and during our recent tasting in Lisbon, we tried amazing wines from all over Portugal based on Touriga Nacional. Blended with everything from native varietals of Portugal to international varieties like Cabernet Sauvignon and Syrah. Ionones are the volatile chemicals that produce the aroma in wines. Although I am not sure this really helps me because I already know the aroma is there, but I will do my best to seek them out in the next Malbec I try! Blue and Black fruits – Black berries, blueberries, dark and staining overly ripe berries! You know the smell, where the berry begins to border on liquor notes. Think fresh backyard fruit, not store bought sterile under ripe stuff! Spice – Yeah I get spices, but usually as a backdrop to the fruit and flowers. I would elude cocoa as a spice and at times the sweet flavor of allspice that seems to fade in and out as the wine develops. Fruit – Same as above but think blackberry liquor, not the sweet part, but the intense fruit quality. Actually, why don’t you throw in the seeds too, while you’re at it. Think of when you bite down on a seed and you get that wood/vegetal note. That’s the one I’m referring too! Spice – (Gabriella) From my experience with the grape, I consistently get a black pepper quality that offers that perfect dark exotic flavor that pairs well with most rich foods. It’s never overwhelming to me, nor does it take precedent over the floral notes, but it always seems to creep up, especially on the nose! Flowers – I don’t make it a practice to munch on flowers, but I will say that the way in which new flowers smell sweet, almost fruit like, is the exact floral note I get. I remember as a child there was a flower that grew in the fields of the park by our house. I forget the name, but if you snapped off a flower and bit into it, a small but intense sweetness filled your mouth. This is what I, personally, think of when I taste this wine. Texture – This wine can be quite large with an overwhelming body. The positive side is that the tannins tend to be very fine. Almost chalky but with a nice acidity to freshen the mouth. I love the play between acid and tannin with this grape, allowing wines that are big but also fresh and alive. Also due to it’s intense flavors you are starting to see people using this grape in wines of California, Australia and a few other places where they are experimenting to see if they can harness this grapes intensity in their wines. Search one out! Tell us what you think. Then post a note in our forum!